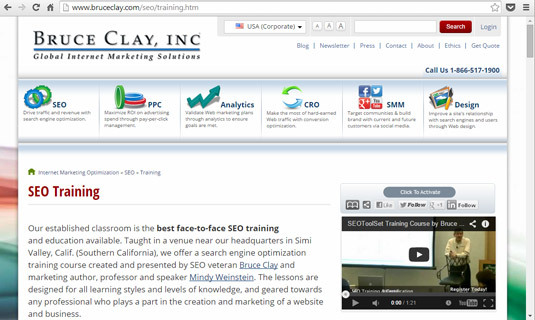 To include a video on your website, the SEO best practice is to embed it within the applicable page. Don’t show it in a pop-up window where it’s isolated from the text describing it, because you want the spiders to see the video as part of the current page. Many sites move videos into separate windows with no title or text, but this is a lost opportunity from an SEO perspective. Unless you describe the video in words the spiders can read, more than likely it won’t be ranked with your content because the search engine cannot tell what it’s about. Embed a video on a page that has closely related text. If you’re worried that your page may load too slowly if you embed the video, here’s one possible solution. The video can be collapsed when the web page initially loads, displaying only a link to it. Then if the user clicks the link to watch the video, it can expand and play within the page. This technique uses an expandable Div tag that works like a toggle switch, expanding or collapsing the video at the user’s choice. You may find that this improves the usability of your page because the user stays in control. If you upload videos you produce and save them on your own website, the search engine optimization benefit is that click-throughs go to your site directly, not to a third-party hosting site. You can do a big push to get it noticed, such as promoting your new video with a press release, a blog post, social media links, word of mouth, and so on. With any luck, your video will get talked about and linked to. Search engines following these links will understand that your site gets the credit for originating and owning that video; then optionally, you can later upload the whole video or an excerpt to a sharing site like YouTube, as well. If you upload a video to your site, where you save the video file matters. For example, if your video shows the inside of a Ford Mustang and plays from your Ford Mustang page, save the file inside a directory in your Ford Mustang silo rather than, say, in a video directory within the site. That way, the search engines know for certain that it’s a video about Ford Mustangs. For videos hosted on your own site, you’ll want to use HTML5 as the player. HTML5 is compatible with most browsers, plays well on mobile screens, and enables native video embedding. As for the video file format, there are many acceptable types; MPEG, MP4, and WebM are just a few standard ones. Your choice should be based on your needs. Another best practice for SEO is to use Schema.org markup to label various pieces of information about your video on the page where it’s embedded. This helps search engine spiders better understand that it’s a video with various properties so that it can be indexed. Finally, you want to create a video XML Sitemap and submit it to Google Search Console and Bing Webmaster Tools. This step helps ensure that the spiders find and index your video content quickly. Hosting your own videos may not be the best course of action, especially if your site has limited server resources. A limited amount of bandwidth can cause a problem because videos can be very large files. You might prefer uploading videos to a third-party video-hosting site and simply pasting the provided embed code on your site where you want the videos to be viewed. Read on for more about posting videos. When you’re deciding how big to make your video, consider your audience first. If they tend to have the latest technology and fast Internet connections, you can upload large-display, good-quality videos without too much concern for their big file size. But if your audience is varied, or not technically savvy, you may want to stick with smaller files that can easily stream over lower Internet connection speeds. Quality in this sense refers to the resolution of the video image (how clear it looks compared to the original) and how clean the audio sounds. The higher the quality, the bigger the file. You might be tempted to put a full-size, full-quality video on your site because it looks and sounds great on your desktop, but after it’s online, it may be too large for anyone to download. Weigh what’s best for your audience. Studies have been done on video quality, and if you have to pick between decent picture quality and decent audio quality, go with audio quality. Most people are willing to put up with reduced picture quality as long as they can hear the audio clearly, but not the other way around. That said, you can probably keep the audio quality at 128 Kbps (kilobytes per second) maximum and meet the dual objectives of good audio quality and good download speed. Shorter videos are easier to watch than longer ones, download faster, and don’t get “stuck” in the middle as often. People also prefer to watch a video that they know will take only a few minutes of their time. They may be reluctant to start a video that requires a lot of time to watch. Consider keeping it two minutes or less.